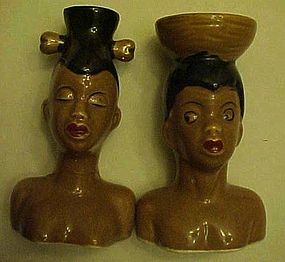 Beautiful Jazz Diva ceramic cookie jar by Clay Art. 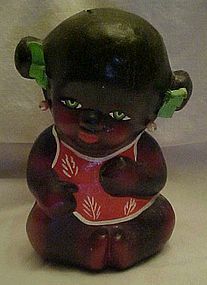 This large and Lovely Black lady is belting out a tune, with microphone in hand. So realistic looking and such a beautiful cookie jar. PERFECT condition. Measures just over 13" tall. YOu will fall in love with her! 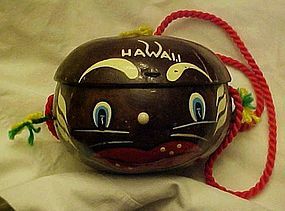 Adorable collectible little bank. 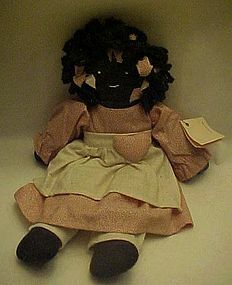 A little black girl child looks about 2 years old and is hand painted with attached fabric bows, and attached pink pearl earrings. Made of hand painted red clay pottery. Coin slot in her head, No place to retrieve your $ from the bottom either. You would have to break her. Measures 6" tall, and is in excellent condition. 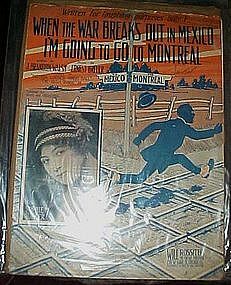 This is a really cool item and very collectible. 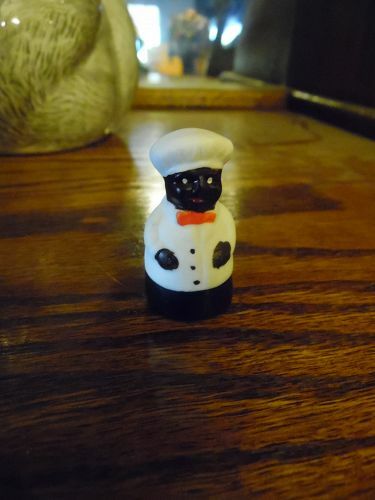 Made of pottery with a solid black shiny glaze. 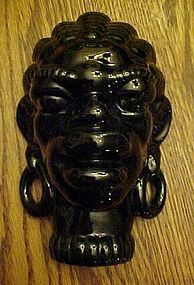 Awesome head of an african native person. Beautiful, perfect condition. 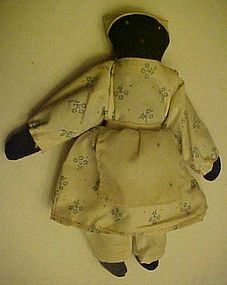 Measures 6 1/2" tall with a large hole in the back so you can hang it. Unknown to me, who the maker is. 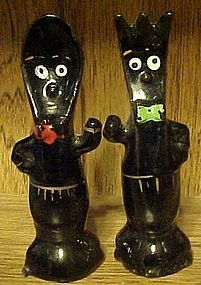 Vintage anthropomorphic Salt and Pepper Shakers, Black Fork and Spoon with funny cold paint faces. 4 3/4 inches high. One teeny chip on the toe of the pepper. There is some wear on the ties paint. You usually see these in white. Original old corks. 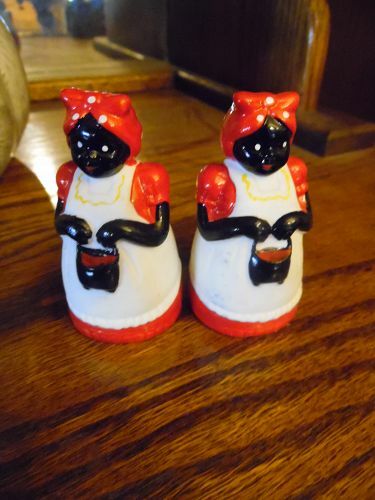 Take a look at these wonderful Black Native salt and pepper shakers. 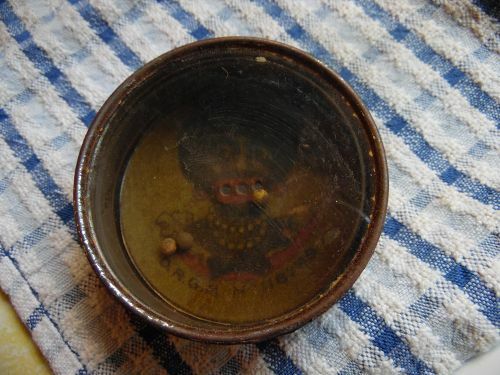 They are perfect and still have their original brass hoop earrings and nasco stickers, and original corks. Hand painted detailing is excellent and not flaked. 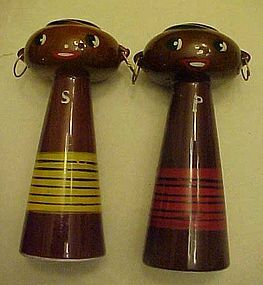 Back of heads are flat and shakers are meant to be stood back to back. These are quite tall measuring 6". Foil stickers read: Del Coronado Nasco product Japan. 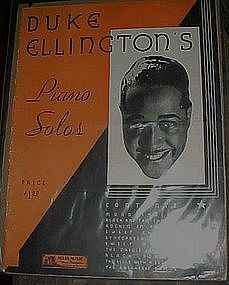 Vintage 1931 folio book of Duke Ellington's 10 favorite piano solos. Solo's include Mood Indigo, Black & Tan Fantasy, Rockin' Rhythm, Sweet chariot, Syncopated shuffle, Sweet Mama, The Creole Love call, Black Beauty, The blues with a feeling, and the breakfast dance. 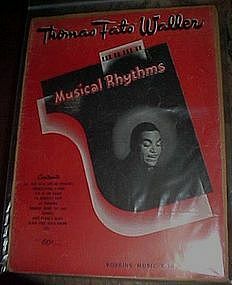 Introduction gives a brief history of this marvelous musician known as "Harlem's Aristocrat of Jazz. 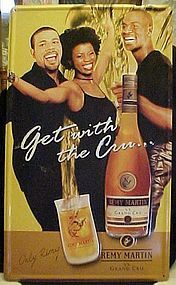 Cover art by Leff and a picture of Duke Ellington too. Wonderful condition, 30 pages. 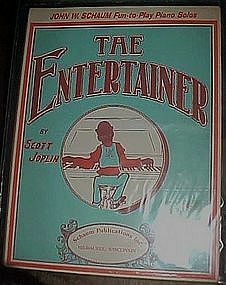 1974 reprint of the old original music from 1903 by Scott Joplin. This is the John W. Schaum Fun-to-play piano solo edition. 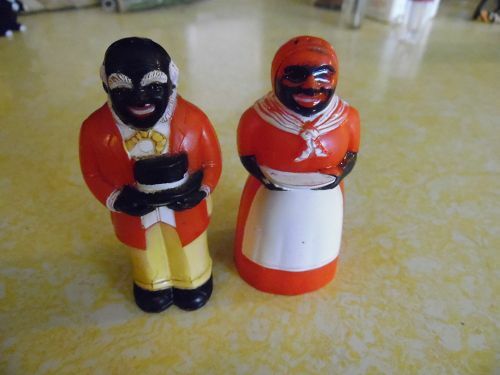 Black caricature of black piano man Great condition.